It's no secret that Asian beauty products have finally earned a major following all around the world, and with good reason. For the past few years we’ve been looking to South Korea in particular for some much-needed skincare inspiration, and as for the super stylish nation’s obsession with sheet masks and cushion delivery? Both are now ALL over department stores all around the world, with new formulas always in development by some of the Western world’s biggest beauty brands. "Koreans are serious about their skin care," Charlotte Cho, the founder of sokoglam.com, an online store specialising in Korean beauty products, told Allure last year. "They also know what they want — innovation, gentle ingredients, pleasing packaging—and they definitely don't want to pay a fortune for it." All of those qualities can be found in the 16Brand makeup and skincare lineup, which is one several great K-Beauty offerings now available at Mecca Maxima and online at www.meccabeauty.co.nz. Two years ago Chosungah– the famous K-beauty makeup artist and beauty innovator seen at work, above - launched 16Brand as a little sister to her mainline, Chosungah22, which is also now available at Mecca. 16Brand has a little less in the way of skincare than the other Chosungah lines (Chosungah22 and Original Raw), but is all about big, bold colour and super glow-y results, and the price point is amazing. 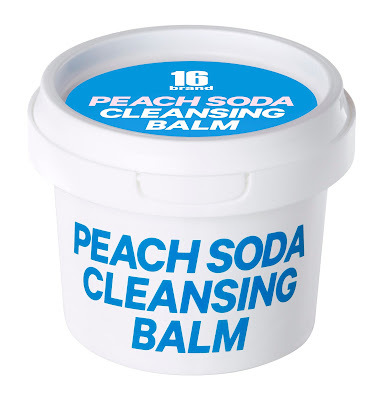 The first product I’ve had a play with from the line is Peach Soda Cleansing Balm, which is an absolute revelation. I have long been a fan of balms for cleansing the skin (especially during the cold months), and regular have a few on the go. This one is different however in that it literally melts on contact with the skin – like almost zero massaging in or around to spread, and makeup disintegrates before your eyes. Crazy! Bursting with juicy peach extract, this solid formulation delivers deep hydration to leave skin super soft and comfortably clean without any associated tightness, and can be tissued off or rinsed thoroughly before patting dry. It goes without saying that it smells amazing, and that the packaging is K-cute. Also in the range is the awesomely named Donkey Milk Cleanser, which actually harnesses the intensely nourishing properties of donkey milk! Ultra-gentle and conditioning; this cleansing solution is mild but also mega mighty. The foaming action deeply cleans and dissolves impurities from the pores whilst nourishing properties moisturise, soothing and soften skin. There is also Donkey Milk Cream, which was formulated with 10 per cent donkey milk and reportedly instantly quenches parched skin for 24 hours whilst brightening dull, fatigued areas and shielding from environmental aggressors. And what's more? Sensitive, stressed skins need not fear, as the decadent cream is enriched with soothing calamine to calm any irritation and restore skin to its glow-iest state.